“Did I get them out?” is the first things your friend says after a nasty collision at home plate. The people gathered around the downed baseball players immediately break out into a chorus of relieved laughter…that is until one of them gets up and flashes a smile sporting a fresh, new gap. Everyone looks at each other, not knowing what do to. How bad is this? Who should we call, if anyone? Dr. Krista Cayo, your emergency dentist in St. Peters, let’s you know what to do during a dental emergency. If you are questioning whether or not you are in a dental emergency, the key indicator is pain. 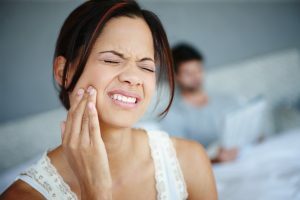 If pain is the most prevalent thing in your mind and you cannot ignore it, you are definitely having a dental emergency. The first thing you should always do if you find yourself in a dental emergency is call us at Cayo Dental Care. That way the team can start to prep for when you come in, as well as give you advice of what to do in the moment. Some basic tips are to rinse the area with warm water in order to clean it. If a tooth have been knocked out, try to find it so you can either place it back into the socket, or store it in milk or saliva as you’re heading to the office. If a tooth has been cracked or damaged, try to reposition gently with your finger and hold it with your jaw to keep it from moving. We will always try to see you the same day you have emergency. We will instruct you on what to do if we cannot. If you are experiencing any other injuries, such as broken bones, or cannot stop the bleeding, please contact your local emergency room. The best thing you can do during a dental emergency is to stay calm so you can think clearly and minimize your discomfort. Be sure to put Cayo Dental Care’s number into your phone so you can save precious time. You can be assured that no matter what situation you are in, we will be able to take care of you. Should you ever find yourself in the middle of a dental emergency, try to remain calm and call us.